A short walk from the Two Towers is the Palazzo della Mercanzia, a striking building noteworthy for its two Gothic arches. 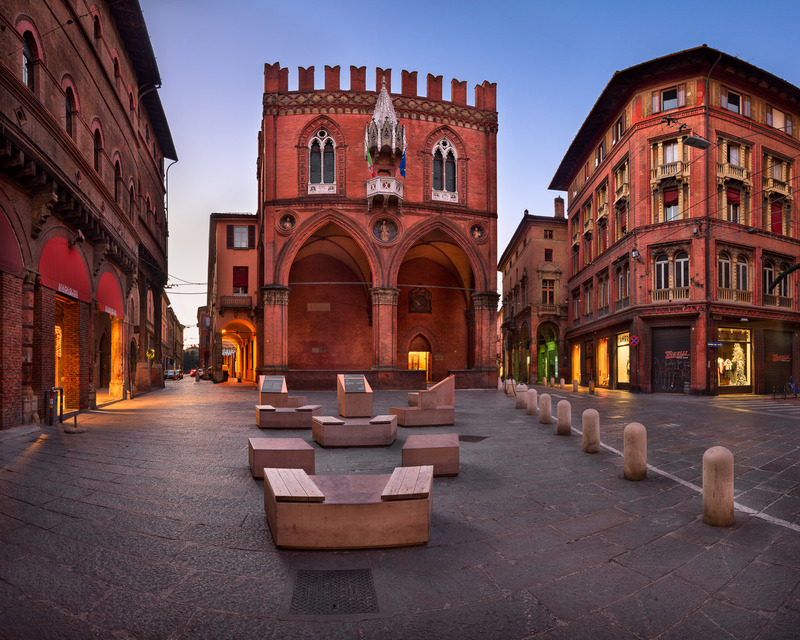 Built in the fourteenth century when Bologna was a wealthy commercial center, the Palazzo was constructed to be a base for those governing trade in the city. The building still houses the city’s Chamber of Commerce. December 2016, panorama from 3 vertical images, additional exposures for highlights, focal length 16mm, aperture f/8, shutter speed 2 seconds, ISO 100, tripod. It’s a building with an interesting history. The sides of the building are watched over by statues of four saints — the city’s protectors, as well as statues of St. Peter and St. Anthony of Padua. But under the watchful eyes of saints, the city’s business disputes were settled, and businessmen found to be unscrupulous were tied to a center pillar and publicly shamed. In keeping with Bologna’s image as a city of epicurean delights, the Palazzo is now home to perhaps the most valuable of the city’s treasures: Bologna’s prized “official” recipes for Bolognese ragu, tortellini, and mortadella. I made the short walk over from the Two Towers as early morning sunlight was breaking over the piazza. I had the area to myself and focused on the Palazzo, guarded by saints and repository of sacred recipes.